As a manufacturer or distributor of highly configured products or solutions, you face a variety of business challenges, including shifting demands. Customers today expect an unprecedented level of customization— with prices and service to match. To be successful, you need to increase the effectiveness and efficiency of your sales, manufacturing, engineering, and marketing. Give the power of advanced configure-price-quote (CPQ) technology to your entire network through Infor® Configure Price Quote (CPQ). With this image-driven, easy-to-use solution, you’ll guarantee one vision from order to delivery—and be able to cut costs and boost profits. Extend CPQ to your dealers and distributors—Your entire sales network can generate accurate quotes and proposals that take advantage of 2D and 3D images for faster ordering and customer confirmation. 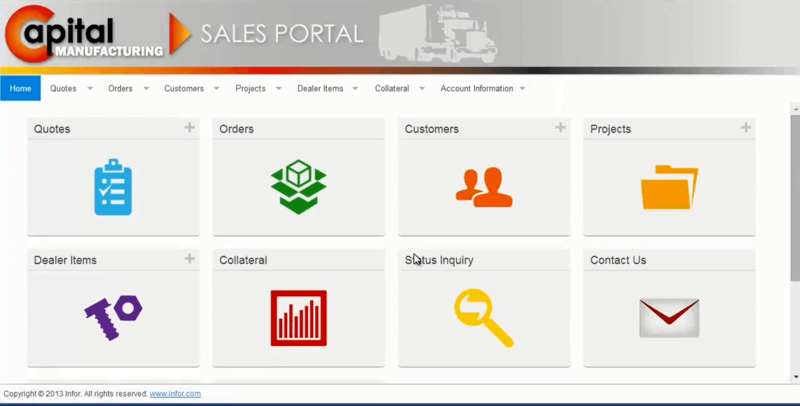 Increase sales and order add-ons—Use our robust Infor Sales Portal to show all available options, including dealer-specific accessories and services. Reduce cost-per-order—Eliminate manual entry for sales order details, bills of materials (BOMs), and routings for all potential product combinations. Improve accuracy and customer satisfaction— Shorten your turnaround times and wow customers with precisely customized deliverables. Differentiate your brand through innovation—With exact technical specs and images, engineering can focus on innovating, and marketing can quickly roll out new products and options to customers. Through a simple click in the visual catalog, customers can easily find and select product preferences. Quickly turn new hires into product experts— Customers and sales reps use an easy, guided quoting process, replete with all technical specifications that quickly navigate them to desired selections. Accelerate the documentation process— Automatically produce BOMs and instructions, then send them directly into your ERP system and generate detailed proposals to send to your customers. Integrate with your enterprise resource planning system—Add the power of visual renderings and CPQ technology to Infor ERP systems (Infor LN, Infor M3, Infor CloudSuite™ Industrial (SyteLine)), Oracle® E-Business Suite, Microsoft® Dynamics AX, and many other ERP solutions. Learn everything you need to know about Infor CPQ. Our experts will reach out to you shortly.